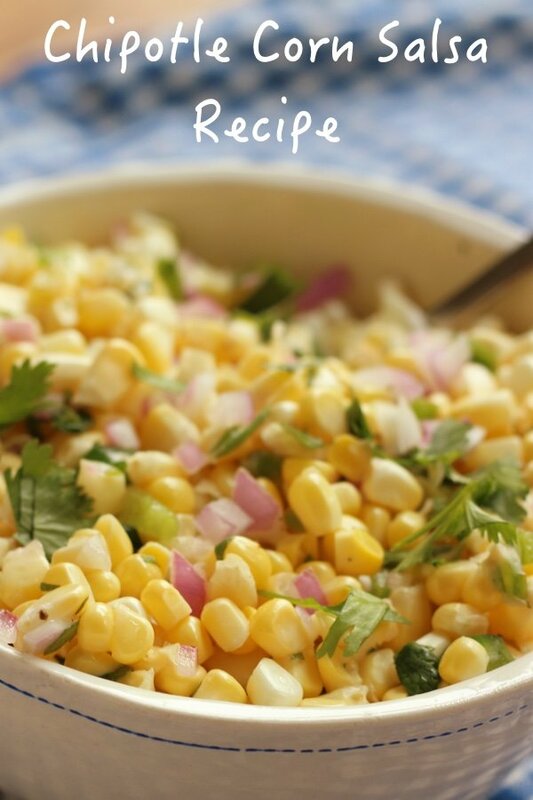 Are you looking for a Chipotle inspired corn salsa recipe? This is very close to the corn salsa they have behind the sneeze barrier. Recently I posted Chipotle black beans recipe and was asked if I could take on their corn salsa. I happen to love the Chipotle corn salsa and order it every time I go there to be added to my salad. Chipotle is one of the few places that you can order more salad on your salad. The only thing I hate about Chipotle is the amount of sodium found in their food so I was careful here to keep the salt low. I believe you could do ¼ teaspoon of salt and it would be very tasty. Since it is corn season, I used fresh corn. Slicing it off the cob is very easy. You stand it up on your cutting board (or in a low bowl) and run the knife along the tough interior center. It makes a bit of a mess (any tips out there on how to keep the kernels from going everywhere?) but the results are far better than with frozen corn. I just want to shout out to Misen. They sent me the knife in the photo and it is wonderful. Check them out if you are looking for a chef's knife. I use 1-2 jalapenos because you don’t know until you get home how spicy your jalapenos are. I take a small taste – sometimes they blow my face off – other times I can eat the whole thing without a sting. My whole family enjoyed this and demanded that I make it again. I hope I can keep creating Chipotle dishes at home so I don’t have to take them there. That place is pricey! What do you do with fresh corn? Please share. The Misen knife was received for review consideration. No other compensation was provided. 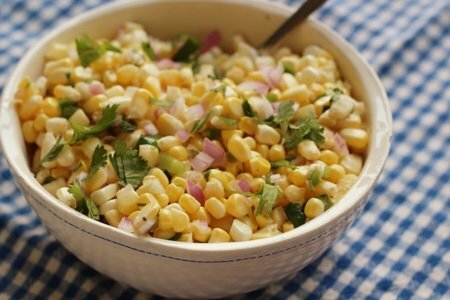 Mix corn, jalapenos, red onion, lime juice, lemon juice, salt, and pepper in a medium bowl. Allow to marinate for 30 minutes or up to 4 days. Lisa, I've never had a corn salsa, sounds interesting but most important it looks really good. Being I love corn i'm sure it would hit the spot. I need to thank you for all the wonderful recipes you have saved me from boring healthy food more than a few times. Lisa - a way to cut corn off the cob and keep the kernels from flying all over is to place a clean dish towel on top of the cutting board. The kernels will stay around without bouncing everywhere. Then, bring up the edges of the towel and dump into your bowl. Been eating lots of sweet corn lately in my salads too. 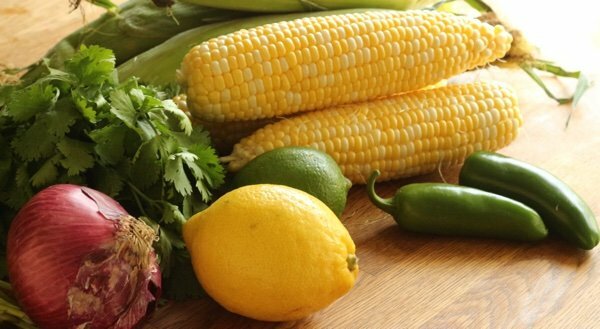 This corn salsa recipe, sounds very refreshing. It's always wonderful having more fresh veg ideas! FWIW, I was interested in your Misen chef knife. It looks very nice at $65. When I looked on Amazon, they are offering it at $45 with teeny imperfections that they claim are 'pin dot' in size and each knife has only 1 to 3 of these dots. It seems like a good savings on an otherwise quality knife. Another way to keep the corn kernels under control is to stand the the corn cob up on the middle part of a Bundt pan and run the knife down the cob (just like you would do on a cutting board). The kernels fall down into the pan! Will definitely try this, substituting sweet for red onions. I love the taste of red but they don't like me. Thank you for your recipes and information......I feel I can trust your comments. @Nicky - not a stupid question! Use raw corn. Thanks for asking! Why does this recipe have so many points when everything in it is free? The new WW program has me confused. @Cissy - That was my fault. It now has ZERO Freestyle SMartpoints. I am sorry about that. Thank you for your comment! I have fixed it in the above post. 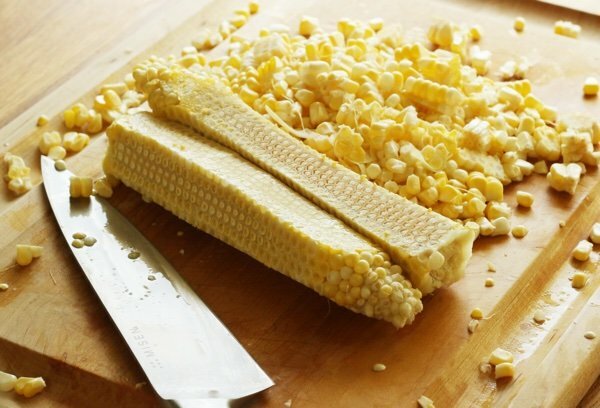 Can you use frozen corn in place of corn on the cob? @Patty - good question! I think that would work. Thanks! This looks great! An excellent frozen corn to try is Trader Joe’s fire roasted corn. I use it in another “salad” with lime, tomatoes, avocado, cilantro and a little bit of balsamic. It’s super yummy!! Question: How was the salsa intended to be used by you? Lisa, I have been using an angel food cake pan for cutting corn off the cob. It works really well. Made this last night with some fresh corn from the market. Excellent!